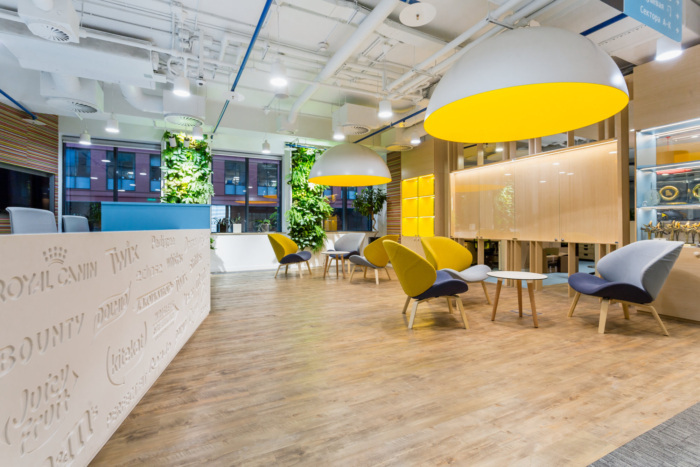 UNK project designed the first pet-friendly offices in Russia for global food services company, Mars, located in Moscow, Russia. Mars employees can now take their pets to work with them. Mars was one of the first companies in the world that 20 years ago implemented this practice on a systematic basis and has repeatedly proven that animals have positive impact on humans and vice versa. The office occupies four floors of “Alcon” business center. This project embodies One Mars concept, which has gathered under one roof all the divisions of the company. The space is organized in such a way that workplaces are located along the windows and thanks to this planning, they enjoy natural lighting, while restricted areas are recessed away. The project employs only environmentally friendly materials, for which the Mars’ Moscow office was awarded the LEED gold certificate. For the award to be granted, all design solutions must comply with international environmental standards, and these conditions are very stringent. The office project also uses the latest technologies to manage engineering systems, which significantly save energy resources. As large crowds of people are expected to be present in open workspace, the installation of sound-absorbing elements was another goal of the project. On the ceiling, the architects have installed special hanging plates by Ecophon with sound-absorbing properties. The walls of the meeting rooms are made of glass and covered with curtains made of acoustic fabric, and some blind partitions are lined with felt panels.